This marks the tenth year I have written about the Beijing food and drink scene, first with an e-newsletter and then with this blog. I dug up my first newsletter and, as expected, it includes a mix of places long gone and a few that yet survive. You’ll find it below, with a few comments in brackets. Welcome to the first issue of my yet-to-be-named e-newsletter. This one is strong on bar and restaurant write-ups and includes one very ironical “irony of ironies” story (see Fateful Day at First Café below) that shows Beijing isn’t quite as big as it seems. Comments, questions and constructive criticism (and potential names for this e-newsletter) are welcome and will be addressed in later issues. The annual Hilton wine fest a couple of weeks ago filled two floors of the hotel with over 160 producers from Canada (How often is Canada listed first when it comes to wine? Go Canada! ), Italy, Australia, the U.S., France, New Zealand, Chile, South Africa, Germany, Austria and other grape-growing nations. I tasted 52 wines – these were sips, not full glasses, my friends – along with the buffet, for a measly RMB250 (US$30). I also looked like a total poseur by writing tasting notes in my little black pad–unfortunately I forgot my turtleneck sweater and Robert Parker book or I could have really stood out. But when you’re going through enough labels to make a deck of cards, you need a way to remember what was good, bad and ugly. It’s funny how my early notes use descriptions like “fruity,” “fresh,” “acidic” and “earthy,” while later ones are more, uh, creative: “hints of Sprite,” “honestly mundane,” “this grape’s got [sic] identity crisis” and “tastes like birch bark” (which I’m pretty sure I’ve never tasted). It’s also funny how you think a wine tastes like, say, birch bark, but then the distributor approaches and says it has “a delicate nose, a full body and a passionate finish”, and you suddenly realize it’s true! (And, in the case of this description, get turned on.) When the same expert points out the “notes of Saskatoon berries,” you swear you can taste them even if you’re never eaten, seen or heard of this fruit or know where Saskatoon is (it’s in Canada, which at least in this inaugural newsletter, ranks first in wine. Go Grape White North!). This was my fourth superb dinner at the Louisiana and the place should be a nominee for that’s Beijing magazine’s annual restaurant awards. [The guys who ran that’s Beijing now run The Beijinger.] In any case, Dan, who hails from Massachusetts, deserves special credit for this last meal because, on that very day, his Boston Red Sox slipped behind the New York Yankees in the pennant race. Grace under pressure. To my horror and delight, Rich bought me a martini. Horror, as my last Ice House martini had “notes” of kerosene, and delight, since I rarely get free drinks and this one was good. Take it as a sign from Buddha that Ice House is poised to be, as many expect, a major player on Beijing ’s high-end bar scene. After the show, a few of us took John and Tom on a tour of some Beijing night spots. It’s hard to beat the spacious rooftop deck at Suzie Wong on a cool fall evening. [Suzie is still around.] Funnily enough, my colleague Lige arrived and remembered Tom from a show he did on 72nd Street in New York – five years ago. If that feat of memory wasn’t enough, she recalled three of his jokes, two of which he had told us at the show just a few hours earlier. It is a sad day when your favorite pub is resigned to the empty bottle heap of history. I’m talking about a place where you hang out with homies, take friends visiting China, and hold birthday, going away and Thank Buddha It’s Friday parties; where you show up alone and usually meet somebody you know and, if not, chat up the soul on the next stool. It’s bad enough when such a place is razed for a new, and about to look old in two years, apartment complex or shopping mall. It’s worse when things go awry due to clashing egos. The latter has happened at First Café with the departure of George and Echo, the place’s only two bartenders and arguably the city’s best. (Even my New York City-living, martini-loving friend Ro loves the drinks as does my friend Janalyn, even if she heads for unconsciousness after the first sip–Janalyn, jet lag doesn’t last three months!). I’ve given out 120 First Café business cards and taken 50 friends, colleagues, clients and acquaintances there over the past year. 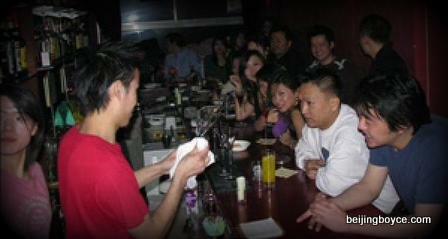 It was a cozy spot with great ambiance, a good clientele and, most importantly, bartenders who know their craft. At the same time, I and other patrons have told management many times to do something or lose their bartenders. “No one listens to people with curly hair,” as the old Chinese saying goes, and now we must wait, with great thirst, for George and Echo to pop up in a new locale. I met up with them shortly after the Fateful Day at First Café – it created a good excuse for us to sample three 12-year-old whiskies I brought back from vacation – and they have some new tricks up their sleeves to concoct even better martinis. The big question now: Will First Café continue along the familiar path of many other small bar and restaurants? A cozy place opens and offers something unique in the way of drinks, food, ambiance or service; it builds a cult following and those supporters bring their friends; it starts booming and everyone takes credit (the managers assume it’s their administrative genius; the bartenders or chefs their creations; the customers their gratis marketing); a key manager, bartender or chef leaves and quality slips; the place continues to boom for a few months on the momentum of pre-fallout days; then there is a drift to mediocrity and, often, closure. Time will tell, but just as an excellent martini has a last slip, so, too, do good bars come to an end. A colleague and I recently phoned in sandwich orders to Sequoia Café at lunch. Given the spotty delivery service in Beijing, I ended up calling the place a while later. I asked for the owner and said, “Hey, we ordered two sandwiches and…” Before I could finish, I felt him tense up on the phone with one of those “Uh oh, we forgot to deliver them” vibes. But all I wanted to tell him was that the sandwiches came faster than expected and were tasty as only bakery-fresh bread spread with creamery-fresh butter can be. Anyway, complaints are a dime a dozen in this town, so let’s give praise where it’s due. This incident shows it’s possible to quickly deliver good food in the CBD (Stone Boat, take note). Beijing has started an etiquette program for taxi drivers and not a moment too soon. I’ve never been ripped off by a driver here, but have received a fair share of bad attitude. Most drivers are decent and it’s too bad they’re pulled down by a significant minority that desperately need some “thought reform” ~ By the way, the new and spacious taxis introduced during the past year are a godsend. Standing on the eleventh floor of my building and watching those two-toned vehicles–each painted in a primary color with a single gold stripe–zip by is like watching tropical fish in a tank. ~ To those who complain about getting horrible hangovers from five-dollar, all-you-can-drink bars, get real. What else do you expect from drinking the lowest-grade alcohol around? ~ The new Bookworm is open and with its 14,000+ books for loan, three spacious lounge areas, tasty sandwiches and wireless, it’s even better than before. [The Bookworm had previously been housed in the original Le Petit Gourmand space, where Sanlitun Village now stands.] ~ More on the Bookworm in the next issue as well as write-ups on the John Bull Pub tequila tasting, Beer Mania, Beijing holiday adventures, and Jim McGregor’s new book One Billion Customers. ~ JB. congrats Jim, and wishing your liver and pancreas another 10 years of martini sand wine. Was fun to see old names from the past. Say hi to Frank from Sequoia/John Bull for us.